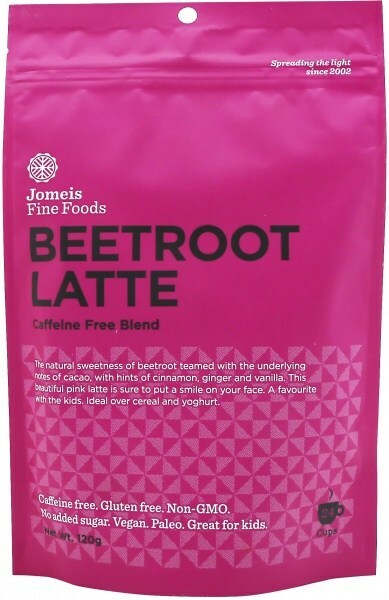 Be extremely delighted with this sweet Beetroot Latte. This 120g, pink-packed latte makes 24 cups. Appreciate the pure sweetness of beetroot blended with a hint of cocoa, ginger, vanilla and cinnamon. It can also be combined with cereal & yoghurt. This uplifting latte is also enriched with antioxidants that help with cell regeneration, and is a great mood setter that will help brighten up your day. Ingredients: Beetroot Powder (45%), , Cacao, Cinnamon, Ginger, Coconut Milk PowderGreen Leaf Stevia (100% natural herbal plant extract).